Improved Curb Appeal: Everyone loves a clean and visually pleasing roof. Imagine the pride you will feel when your roof is like new again. Improve the Life of your Roof: These days, most shingle manufacturers guarantee 25+ years. To get the most out of your shingles, by have your roof treated using our soft-wash formula to extend the life of your roof as much as possible. Decrease the Cost of your Utilities: By removing black stains,vegetation, debris, which in turn provides a more reflective roof surface, roof temperatures may decrease, keeping energy bills, down and more money in your pocket. The less air conditioning and heat used, the better for the environment and your wallet it is! Maintain or Increase the Value of your Home or Business: One of the most expensive investments in your life is your home or business, becoming a an active homeowner with preventative maintenance, you will actively help maintain your roofs structure and appearance, thus maintaining the utmost quality of your property and it’s value. Increase the Life of your Roof: Prevent leaks and cracks from prematurely developing due to algae, moss, and lichen. Increase the life of your roof – metal roofs last up to 100 or more years when properly maintained! Asphalt roofs can last 25 years or more, as well. We Guarantee our Work: We stand behind our work at Wash It Clean. 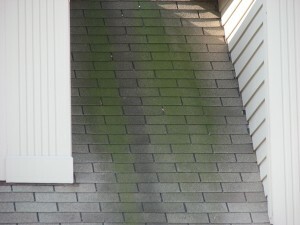 If any algae, moss, or lichen are to appear, simply give us a call and we will happily assist you. Check out our services page for more information. Important Health Benefits: Eliminate mold and other organisms from passing through your roof and into your attic.